Taken on Oct. 10, 1984 the impressive video in this post features the first prototype (serial 82-0062, c/n GG1001, registered N4416T) of the Northrop F-20 Tigershark crashing at Suwon Airbase, South Korea, killing Northrop pilot Darrell Cornell. Actually the clip shows the aircraft crashing at 0:39 while it was performing a demonstration flight. The following investigation cleared the F-20 of mechanical or design issues since it concluded that Cornell had blacked out due to excessive g-forces. Nevertheless the second prototype of the F-20 (serial number 82-0063, registered N3986B, c/n GI1001) crashed in May 1985 at Goose Bay, Labrador, killing Northrop pilot Dave Barnes, while he was practicing for the Paris Air Show. Again the crash was blamed on G-LOC. The F-20 Tigershark (initially F-5G) was a privately financed light fighter, designed and built by Northrop. Its development began in 1975. The aircraft which was a further evolution of Northrop’s F-5E Tiger II, was powered by a new engine that greatly improved overall performance, and a modern avionics suite that included a powerful and flexible radar. 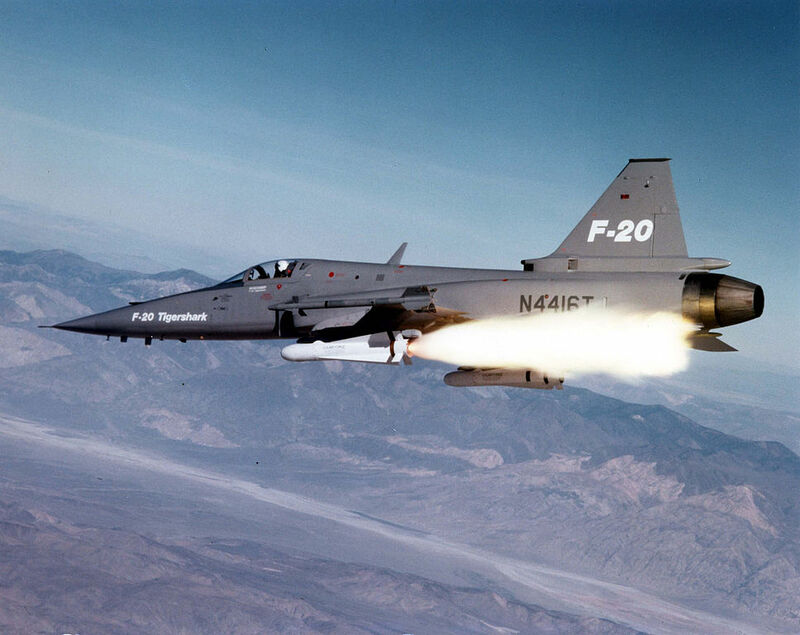 Compared with the F-5E, the F-20 was much faster, gained beyond-visual-range (BVR) air-to-air capability, and had a full suite of air-to-ground modes capable of firing most U.S. weapons. Thanks to these improvements, the F-20 became competitive with contemporary fighter designs such as the General Dynamics F-16 Fighting Falcon, but was much less expensive to purchase and operate. Much of the F-20’s development was carried out under a US Department of Defense (DoD) project called “FX.” FX sought to develop fighters that would be capable in combat with the latest Soviet aircraft, but excluding sensitive front-line technologies used by the U.S. Air Force (USAF) aircraft. FX was a product of the Carter administration’s military export policies, which aimed to provide foreign nations with high quality equipment without the risk of U.S. front-line technology falling into Soviet hands. Northrop had high hopes for the F-20 in the international market, but policy changes following Ronald Reagan’s election meant the F-20 had to compete for sales against aircraft like the F-16, USAF’s latest fighter. The F-20 Tigershark program was abandoned in 1986 after three prototypes had been built and a fourth partially completed.